Oh hey friends! I am so excited to be sharing these cookies with you! You may have seen them floating around the internet lately, as they're Sarah Kieffer's famous "pan-banging cookies". I had a serious amount of fomo for a few weeks after seeing them all over instagram, and then I finally made them myself. I was not disappointed. These cookies are huge, have the cutest wrinkled edges, and are a great way to change things up in the cookie department. And honestly....the pan banging part is so much fun! I think sometimes I get too caught up in cakes and pies and pretty things, that I forget that simple is sometimes best. So get ready for more everyday dessert recipes like this! The recipe comes from Sarah's cookbook, The Vanilla Bean Baking Book, which you should go buy if you don't own it! (Not sponsored....hahaha). Preheat the oven to 350 degrees F. Line 3 large baking sheets with aluminum foil, make sure the dull side is facing up. In a large bowl, beat the butter on medium speed until creamy. Add in the granulated and brown sugars and beat on medium for 2 to 3 minutes, until mixture is light and fluffy. Add in the egg, vanilla, and water, and mix on low to combine. Add in the flour mixture and mix on low until combined. Add in the chocolate and mix on low until just incorporated. Form the dough into 100 gram balls, about 1/3 cup each. (Yes these are large, yes just do it!) Place 3-4 balls onto each of the prepared pans, and transfer to the freezer for 15 minutes before baking. Once you pull the first pan out of the freezer to bake, place the second one in the freezer. 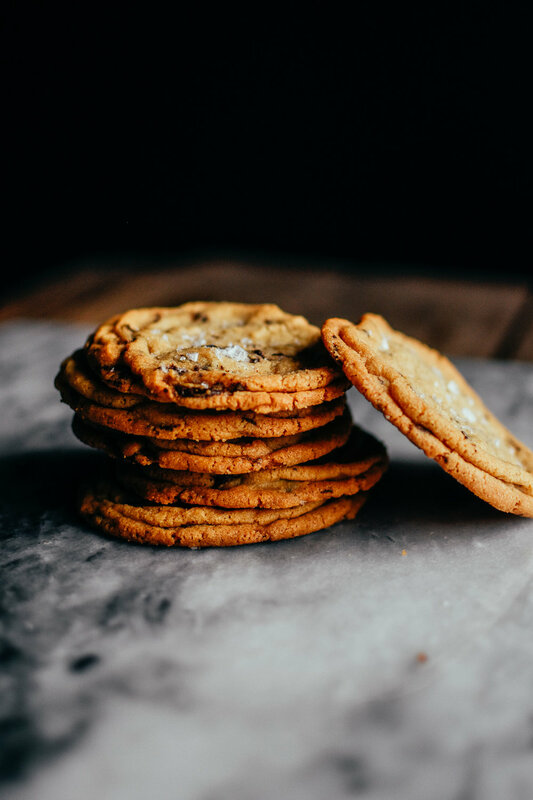 This step is essential in getting your cookies to be the right consistency, so don't skip it! Place the chilled baking sheet into the oven and bake for 10 minutes. The cookies should be puffed slightly in the center. Lift the baking sheet up about 4 inches and let it drop down onto the oven rack. This forms the crispy, ridged texture that makes these cookies so distinct. After the cookies start to puff up again, 1 to 2 minutes, repeat the lifting and dropping the pan. I like to rotated the pan each time as well. Repeat a couple more times. Bake for 16 to 18 minutes total. The cookies should have spread out, and the edges will be golden. The centers should be a bit lighter, and not fully set. Transfer cookies to a cooling rack, and let them cool down completely before removing from the pan. Don't skip the freezing of the cookies! If you make the cookies smaller, reduce the bake time, and you won't get as many crinkles. You can use chocolate chips, but the chopped chocolate is so much better. I like to freeze the cookie dough in balls to be ready to bake at any time, and the baked cookies also freeze and keep very well.